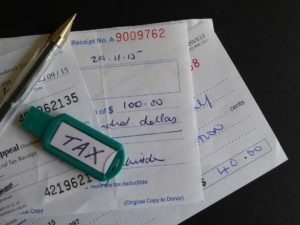 A donation receipt, as the name suggests, is an important document that certifies the fact that a donation has been made to a certain charity or organization. By using such a document, the parties involved not only validate the donation itself but get tax deductions from the government. Since the act of donating is an important process regulated by state laws, issuing the right receipt might mean the difference between the process going smoothly and receiving hefty fines from the government. In this article, we will present a few donation receipt templates suitable for most types of donations, whether cash, for non-profits, churches and so on and so forth. Here are seven donation receipt templates and their uses. The first donation receipt template that we will present is for non-profit organizations. In this case, the receipt should contain the name of the organization that is receiving the donation, the donor’s name, the date and, last but not least, the amount of the donation. This donation receipt must be issued for all donations bigger than $250, otherwise the authorities are obligated to take legal action. Cash donations are not extremely common nowadays, a reality which makes issuing a receipt even more important. A cash donation receipt should contain important information concerning the exact value of the donation, as well as what the donor will get in return for said donation. Along with filling out the name of the charity in the appropriate field, the donor must explicitly state that they are a non-profit organizational entity. Contrary to popular belief, not all donations are spared from taxes. Since the laws themselves change from one year to another, everybody should do the proper research before making a donation and filing taxes. The receiving party should also file a Form 1040 to deduct a charitable contribution. For more donation receipts examples, you can download more templates here. A church donation receipt is as basic as these documents can get. For the donation to be valid, the donor has to fill out the church’s name, the address, tax ID, the amount of money donated, the date of donation and a short description explaining the rationale behind the act itself. When an organization receives funding, it is only fair to send a letter expressing gratitude for the donor’s act of generosity. A thank you letter could not only represent the beginning of a fruitful, long-term relationship but also help secure future funding. Furthermore, as far as the law regulating donation acts is concerned, these types of letter can be recorded as a gift and used for tax deductions. 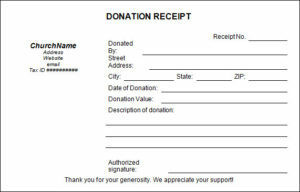 A donation acknowledgement should be structured like any standard letter – a letterhead containing the name of organization that has received the donation, its full address which states the street, number and state, the EIN number (which is used to claim the tax deduction), a formal introduction, the sum of money donated and a few sentences detailing the nature of the donation. 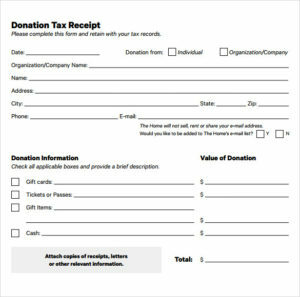 This is a simple receipt template that features general information about the organization that will receive the donation. As the name suggests, this receipt can be used for tax deduction purposes. The donor has to fill out information regarding the date on which the donation is to be made, whether the donor is an individual or a business entity or an organization, the name of said entity, its address, state, zip code, phone number, and e-mail. It is simple, straightforward and it takes only a few minutes to fill it out. 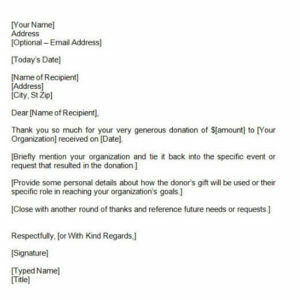 When it comes to donations (or any selfless act of goodwill, while we are at it), a thank-you of any kind is always in order, and this simple donation receipt letter template is only appropriate for this occasion. The following receipt is structured and formatted, from the ground up, with efficiency and ease of use in mind, but not in such a way that it will sound standardized and impersonal. The letterhead is to be filled out with information concerning the name, address and e-mail of the organization which received the donation, followed by the name, address, city, and zip code of the company’s or organization’s representative. As any letter, it begins with an introduction such as ‘’Dear… [name of the recipient]’’, followed by a sentence expressing gratitude for ‘’x’’ amount of money to ‘’y’’ organization, received on a given date. After this introductory phase, the sender should write a few sentences about the history between the donors and the receiving entity, a few personal details about how the gift will be used, followed by a closing sentence with another round of thanks. To surmise, by making smart use of these donation receipt templates, organizations can save a lot of money through tax deductions, and a lot of precious time. Obviously, senders should ensure that all the information filled out is accurate and not outdated, because even a missing comma can throw all parties into a bureaucratic mess that can become very hard to manage.